Mice will make their home out of yours if you let them. All it takes is one visit from one mouse. If your home checks out fine, he and his friends are moving in. Deterring them from making that initial visit is critical if you still want your home to be yours. You’ll run into all kinds of mouse deterrents that claim to stop the little pest from making that first visit, but most of them won’t work. What does work then? Read on to find out. Let’s get one thing clear before we continue. To deter mice and other rodents from coming into your home, you’ll have to put in hard work. This isn’t going to be some easy “trick” where all you have to do is place a few bags of “mice deterrents”. You’ll have to get on your hands and knees and use lots of elbow grease. You’ll also have to dedicate a good 10 minutes or so at the end of each day. If you’re looking for information about how to get rid of mice then check out the other articles on the website. It’s important you understand that deterring mice is great if you’re trying to keep them from entering your home. If you already have mice in your home then you need to get some traps right away. Now then let’s get down to business. The best way to deter mice from entering your home is to close all the “doors”; meaning all openings they can enter through. I say deter because it’s hard to get every possible entry points. All you can do is close up the openings you are able to find. If there’s no easy way to enter, it won’t bother trying to break in. It will just move on to the next house that has its “door” wide open. Look for cracks or holes big enough for mice to squeeze through. Look around the entire house; both inside and outside. A mouse doesn’t require much space to squeeze through. Seal every single one you find. 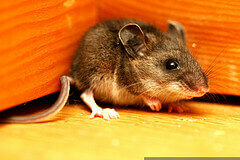 Poorly installed exterior doors or old and worn out doors can also let mice sneak in. Where you want to pay attention to the most is the trim around the door. If there is an opening big enough, it will use it to enter. Check all vents and make sure there isn’t any space too big in the wall where the vent comes outs. Also check that you have a screen covering the vent opening. Once you’ve found the potential entry points, it’s time to close them up. If you’re patching up an opening on the inside, use spackling paste. Spackling paste will work for both drywall and wood. If the opening is bigger than an inch, use a drywall repair patch made of metal, or just a thin piece of metal large enough to cover the opening. You can find both at your local home improvement store. If you’re sealing an entry point located on the outside of the house then use either expanding foam, caulk, or cement. Expanding foam is the easiest to apply, but is limited to openings under 1 inch. Caulk is the same. Cement is good if you’ve got cracks/openings in the foundation. All of these can also be found at your local home improvement store. Mice will enter your home in search of food. If it finds that food is easy to come by then it’s going to stay. More will come and eventually they’ll reproduce and multiply–taking over your house and eating all your food. All you need to do is keep the house clean and limit their access to food. They will move on to another house if they can’t find food. That’s it. There’s no need for a fancy (sometimes expensive) “magic” formula, or products to keep them away (of course, a little natural repellent here and there will help). A little good old fashion cleanliness and common sense is all it takes for a good mouse deterrent that will continue to work as long as you keep up with it.